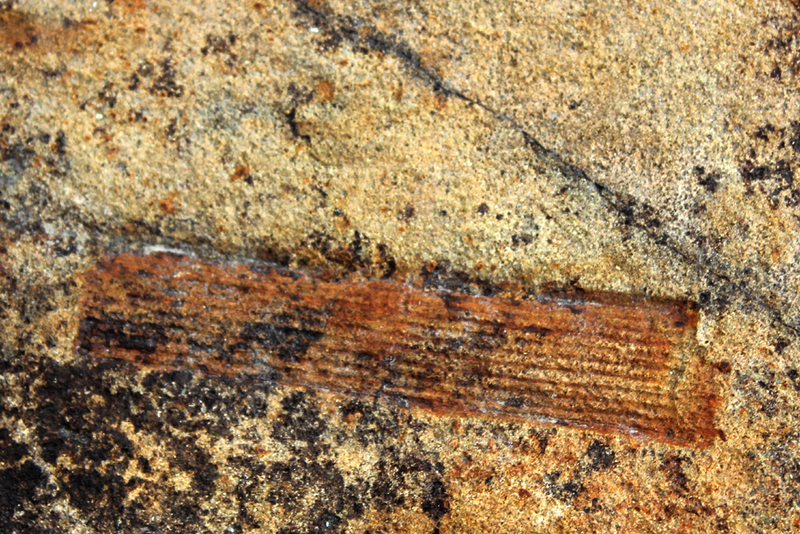 Fossils can be frustratingly, even maddeningly, rare, especially those of vertebrates. Invertebrates, including the hard parts of single cell organisms, can sometimes be so abundant as to make up nearly all of the composition of a rock. 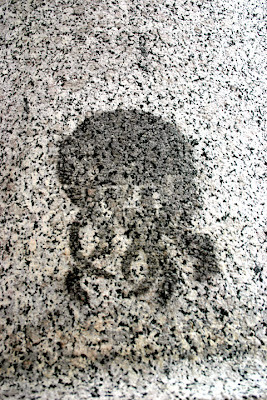 Since some types of rocks are used in buildings it's not surprising that fossils sometimes show up in very public places. One only needs to look for them to see them. 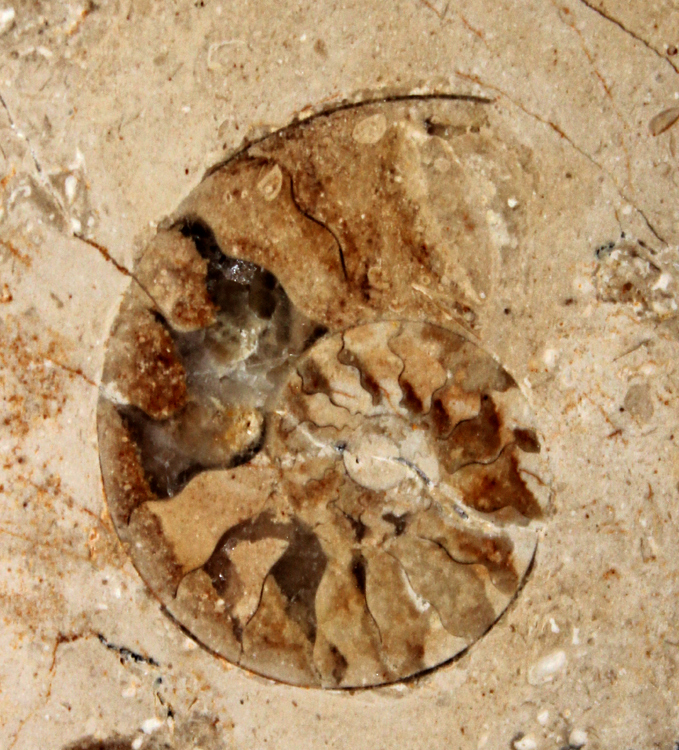 A spiral, chambered ammonite shell in vertical cross section, City Creek Mall. 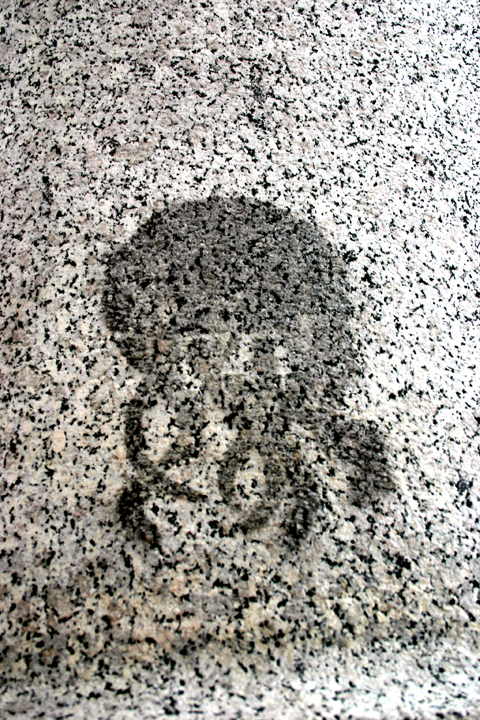 The use of limestone as a decorative building stone often results in abundant fossils that most people simply walk past without ever noticing. The newly opened City Creek Mall in Salt Lake City, with many highly polished slabs of Mesozoic limestone lining its stairways and escalators, is a fine example of this. The pen shaped internal skeleton of a squid-like belemnite, City Creek Mall. In the living animal the head and tentacles would be on the right. I've even seen cross sections of fossils shells in the limestone partitions in men's rooms stalls. I had more pressing concerns on my mind at the time and didn't think of taking my camera with me into the bathroom, so sorry no photos. An ancient scorpion trail in a stone stairway made of slabs of Nugget Sandstone, undisclosed site. 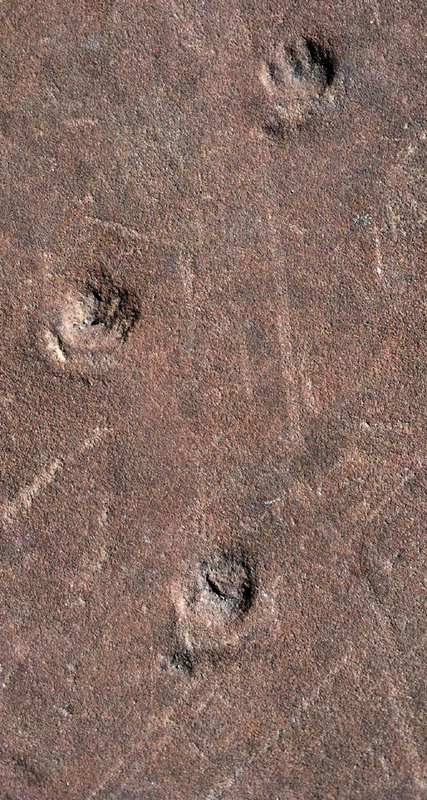 Each circular pit is a leg impression. Direction of travel is to the right. Criss-crossing fossil trails made by arthropod larvae preserved in sidewalk slabs of in Nugget Sandstone, undisclosed site. 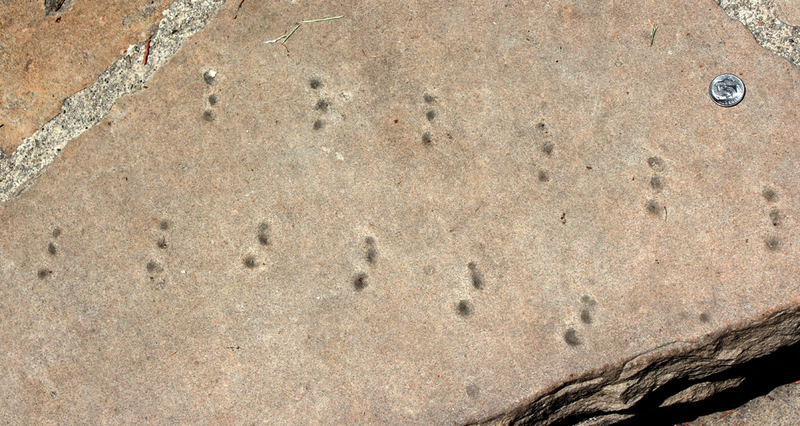 Three footprints made by a long extinct reptile walking up the front slope of a dune in the Nugget Sandstone, undisclosed site. 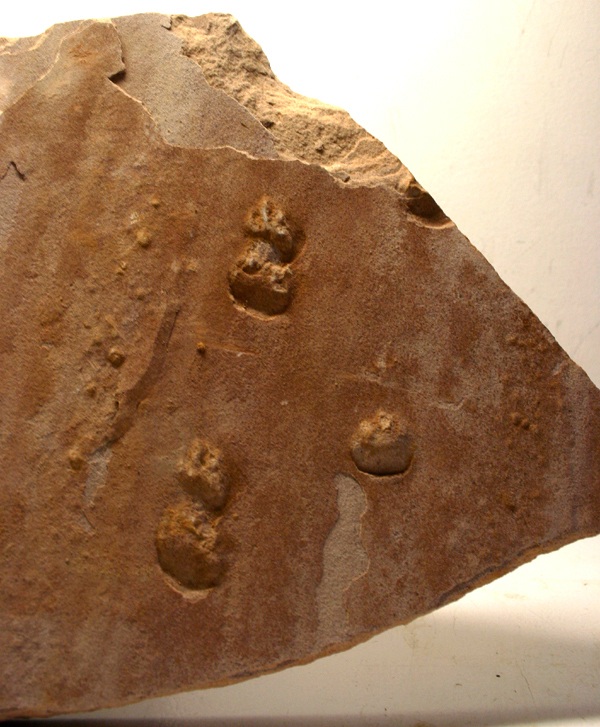 Note the clear toe impressions in the upper track. Nugget walkway slabs are also sold to the public. Lowe's carries large numbers of them in our area and I've often stopped to take a quick peek at the piles. Good thing too, because one day there was a single slab with hand and foot impressions of a reptile that walked across these ancient dunes eons ago. For $6.95 it was mine. 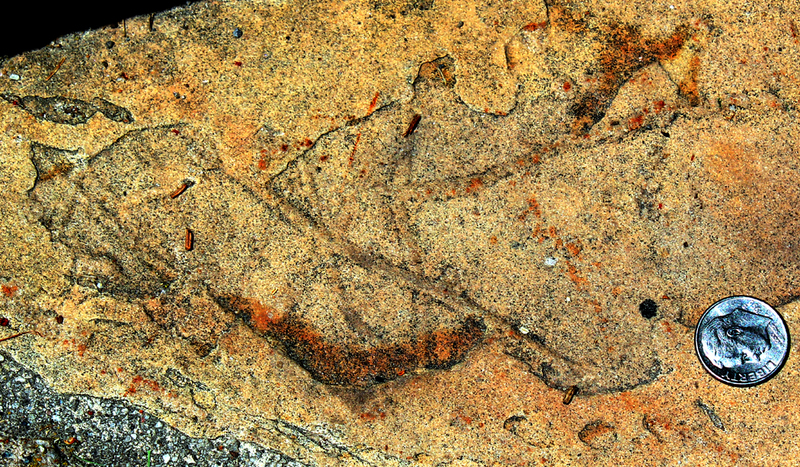 Reptilian hand and foot impressions, Nugget Sandstone, Lowe's, Vernal. Homeowners pile up rocks on their property to form walls, for decorative purposes, or just to get them out of the way. This ring of rocks around the base of a tree on a front lawn shows fragmentary remains of Cretaceous plant foliage. However, one cannot always believe one's eyes. 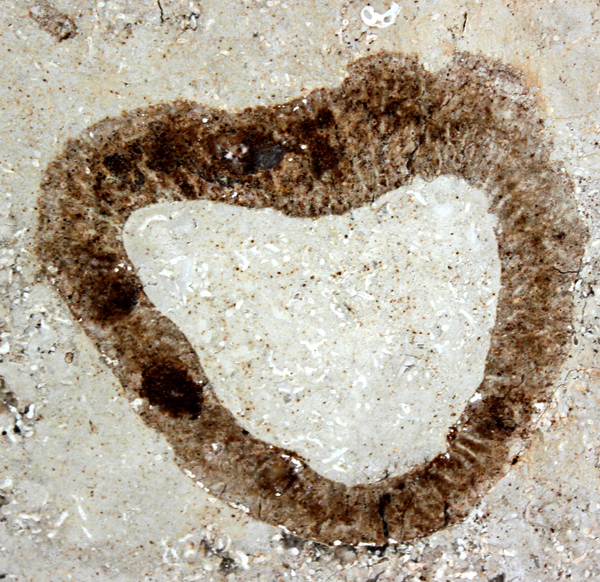 You need to be alert for pseudofossils --- features, shapes, etc. that look like a fossil but are of inorganic origin. 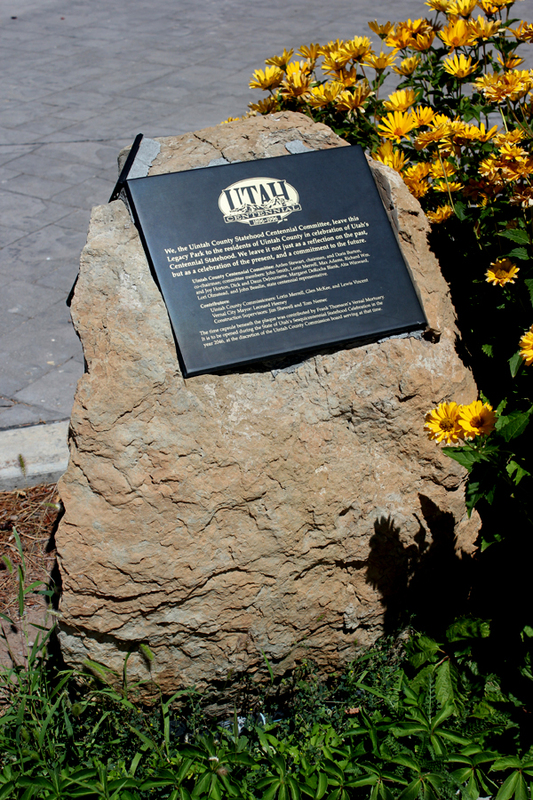 The example below is one of the pillars on the front of the Utah State Capitol building. The pillar, as most of the buildings at the Capitol, is granite, a volcanic rock that forms from the solidification of molten rock in ancient magma chambers. Jellyfish are remarkable for sure, living in environments ranging from the cold waters of the polar regions to the warm waters of the tropics, in fresh water and salt water, and from sunny surface waters to the deepest parts of the ocean in excess of 30,000 feet. Yet no jellyfish are known to live in magma chambers. The dark shape is a natural curiosity of dark mafic minerals that crystallized into a shape that the human visual system and memory interprets as a jellyfish. At the County Court House in Vernal, Utah there's a plaque mounted on a block of Cretaceous Frontier Sandstone However, on the backside of the block there's more interesting reading. Hidden behind a tall patch of flowers is the impression of a fairly large Cretaceous ammonite mollusk. Memorial plaque celebrating Utah's statehood centennial, Vernal. The more interesting back side of the memorial block, with the impression of a spiral ammonite shell. And speaking of fossil impressions, one of my earliest fossil memories is that of a stone shed on my grandmother's property in New Jersey. It was built of stones rounded by tumbling for millennia in river beds . Of the hundreds of stones cemented in its walls, one cobble bore the distinct impression of a small brachiopod. 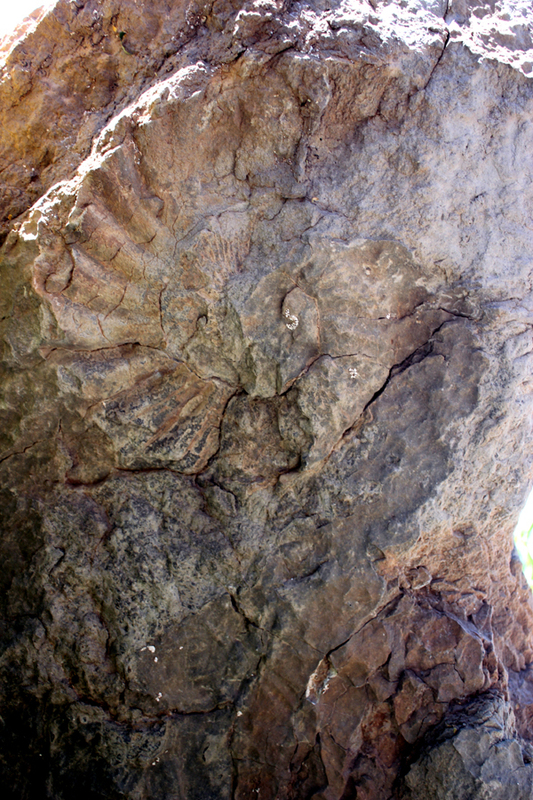 When the gaze of my young eyes first fell upon this fossil it seemed as amazing as any treasure of ancient Egypt. How no one had seemed to notice it was beyond me. Even more puzzling was everyone's apparent lack of interest even after it was pointed out to them. For some inexplicable reason they wouldn't let me take a hammer and bash it out. I suppose they didn't want me to damage the wall. Besides, they were sure that I would soon certainly grow out of my childish mania about fossil. HA-HA, the joke was on them! All photos by the author, with the exception of the reptile tracks from an undisclosed site which is courtesy of Brian Switek..
For the third time in less than a month someone I know has buried an adult child who died way too young. 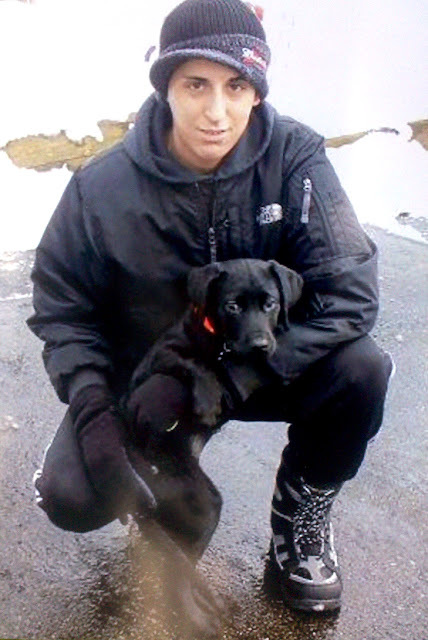 The most recent, and the most personal, was my nephew Matt Den Bleyker, who passed away suddenly from a chronic illness, at the tender age of just 25. Too often our hectic and rushed lives make talking with friends and loved ones a hurried affair. Phone calls are brief, letter writing is a lost art, emails can be impersonal, and text messages are restricted to just 140 characters. It's worth stopping for a moment and thinking about that. If there's someone you care about, let them know. No one ever says "I told him/her that I loved them too many times." More commonly, people wish they had just one more chance to let the deceased know how much they cared. We often get caught up in the things of everyday life and put off meeting or calling those closest to us, with the best of intentions that "I'll do it tomorrow." So if you love someone, tell them. That goes double for the men who say "me too" on the phone when whomever they are talking to tells them they love them. Do you think anyone overhearing that doesn't know what's being said? "Question: And what is the greatest mystery of all? Answer: That Death stalks us everyday, yet we live as though we were immortal." out nine decades wandering the surface of this rocky inner planet orbiting a mediocre star in the outer part of one of the arms of the insignificant Milky Way spiral galaxy. Often it's less, sometimes way too less. So use it as best you can and enjoy the ride. And if you love someone, stay in ouch with them and take -- no make -- the time to tell them. You will never regret it.